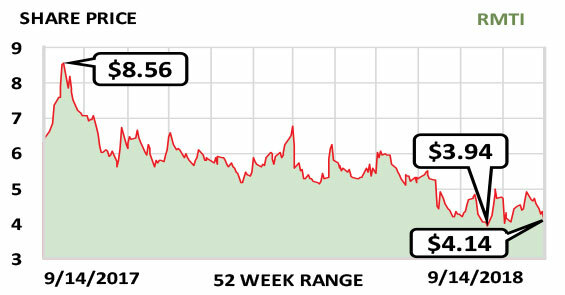 Rockwell Medical (RMTI), a highly focused biopharmaceutical firm, is emerging from a period of significant instability and should break even next year. Its entire focus is chronic and end-stage kidney disease. It provides dialysis drugs and equipment to many treatment centers in the US and other nations. Rockwell also makes Calcitriol, a vitamin D injection needed to counter some of the side effects of dialysis. And it has developed an important first-of-its-kind medicine, Triferic, an iron-maintenance therapy that is administered during dialysis to replace the iron lost by patients during the procedure. However, previous management did not bring Triferic to market because of a dispute over how insurers and the government would pay for it. This led to a major management shakeup, including at the board of directors level. Dissent ran so deep that Rockwell Medical’s CEO and CFO were fired and its CPA firm quit, saying that it had not been given key information. Many of its legal battles are now settled, others ongoing, but the company has just named a new CEO, Stuart Paul—whose background at Abbott Labs and Quest Diagnostics seems an excellent choice for Rockwell’s future. The company is now launching Triferic—and that, along with continued strong sales of other products and an end to the internal legal distractions, should lead this little-followed company to profitability. Revenue was $57 million last year and will likely be $61 million this year and $81 million in 2019 as Triferic sales ramp up. Fiscal year: December. Earnings per share: 2019 est./$0.01…2018 est./-$0.46…2017/-$0.51.